In this model, you purchase and maintain servers and workstations, which comes with significant purchasing and ongoing maintenance costs. On top of this, the equipment becomes outdated and needs to be replaced over time. In this format your server and workstations are provided from managed cloud infrastructure, meaning you don’t have to purchase or maintain the equipment, saving you thousands each year in purchasing, maintenance, on site support and potential downtime. Your cloud server can be scaled up on demand, ensuring you’ve always got the capacity your business needs right at your fingertips, without expensive hardware upgrades. Keep ahead of the competition by utilizing the latest in business infrastructure technology. Our industry leading feature set will give you the edge. Unlike a traditional server, there’s no hardware to purchase. You can get started with your cloud server for under $100, potentially saving you thousands! Deployment, meaning you can order it today and be up and running tomorrow! Your cloud server is accessible from anywhere and isn’t dependent on your site’s power and connectivity. This means that should anything happen to your office, it’s quick and simple to set up elsewhere within hours! Your cloud server can be combined with many of our other products to build a complete cloud office solution. This gives you a single point of call for all of your business data and communication infrastructure needs. No purchasing, maintenance or upgrades to worry about. Your cloud server is hosted on our highly available Australian datacentre infrastructure. Your cloud server is hosted on our “N+1” cloud network. Which is built to be immune to power, equipment and connectivity failures, with complete redundancy from end-toend. We provide a 99.995% service level agreement. Since your cloud server is hosted on our Australian cloud infrastructure, you’ll never worry about hardware maintenance or warranties again. Your servers infrastructure is constantly maintained by our expert technicians, keeping it running at 100% at all times, with no intervention from you. Your cloud server is backed up twice daily, ensuring that you can roll back at any time should you experience an issue with your data, or even accidently delete something. Your cloud server can be made accessible to you directly on your local network over a secure Private IP connection. 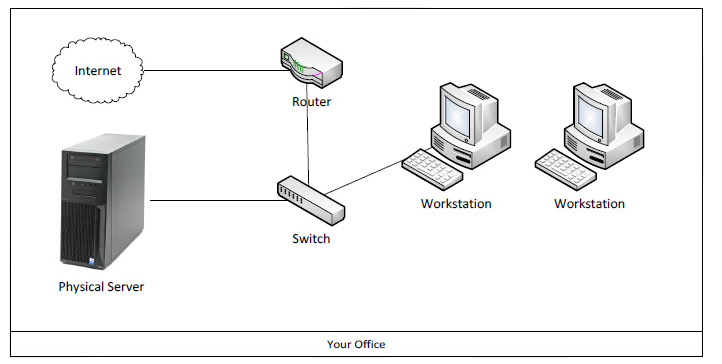 These can be provided via VPN, ADSL, EFM, Ethernet and more. If your business is growing across multiple offices, a cloud server will give you all the advantages of a centralized server without the normally associated infrastructure costs. …and stop worrying about your I.T. infrastructure. This enables you to stop worry-ing about your I.T. and focus on what you do best while we manage and scale your infrastructure as you need it. Every businesses’ needs are different… Let’s discuss yours! Our hosted infrastructure offerings are designed to scale to capacity suited to small business, all the way up to corporates. Contact us today and we’ll provide a tai-lored solution proposal and comprehensive quotation for a solution built to suit your needs and budget.